BitLocker is introduced on Windows Vista and Server 2008 to guard against theft of sensitive drives and cold boot attacks. 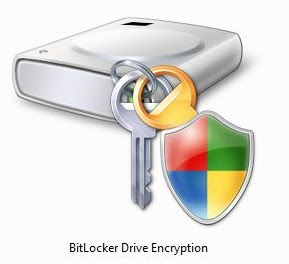 In Windows 7 and Server 2008 R2, Bitlocker further introduces some enhancements, including eliminate the need of pre-creating 1.5GB partition and "BitLocker to Go" for removable media. You can also use BitLocker with (1) Trusted Platform Module (TPM) and (2) smart card certificate for enhanced security. TPM is a microcontroller security chip embedded on motherboard to protect sensitive key materials from unauthorized tampering. 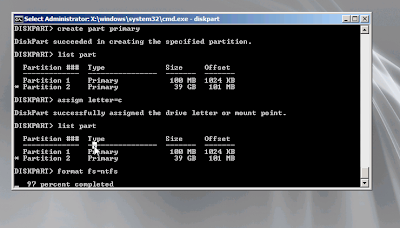 TPM is used for system drive (e.g. C:\) where Windows is installed and the certificate is for data drives, including both fixed and removable media. On the drive that Windows is installed on, BitLocker uses the Trusted Platform Module (TPM) to detect if the computer's critical startup process has been tampered with. Additionally, a PIN or startup key can be required for users to have access to the drive's data. BitLocker uses the TPM to lock the encryption keys that protect the data. As a result, the keys cannot be accessed until the TPM has verified the state of the computer. Encrypting the entire volume protects all of the data, including the operating system itself, the Windows registry, temporary files, and the hibernation file. Because the keys needed to decrypt data remain locked by the TPM, an attacker cannot read the data just by removing your hard disk and installing it in another computer. On fixed and removable data drives, users can use smart card certificate or password to unlock BitLocker-protected drive. An administrator that has been designated a BitLocker data recovery agent is also able to use certificate to recover access to a BitLocker-protected drive. BitLocker and TPM recovery information can also be backup to Active Directory. This ensures that encrypted data belonging to the enterprise can always be accessed by authorized users. Backing up the TPM owner information for a computer allows administrators to locally and remotely configure the TPM security hardware on that computer. As an example, an administrator might want to reset the TPM to factory defaults when decommissioning or repurposing computers. More detailed technical documentation and guides can be obtained from this Microsoft Technet site. More information on BitLocker & TPM Recovery. According to this document, Cisco catalyst switches and Dell PowerConnect switches (in fact, most other non-Cisco switches e.g. Juniper etc) are not compatible on VLAN trunking i.e. single physical link that carries multiple VLANs. This is because Dell and Cisco devices have different default mechanisms for dynamic exchange of VLAN information. Cisco Catalyst switches’ default mechanism is the VLAN trunking protocol(VTP). In contrast, Dell PowerConnect switches use the GARP VLAN registration protocol (GVRP) for dynamic exchange of VLAN configuration information. Because the Dell and Cisco switches use different protocols by default, no exchange of VLAN control traffic will take place – and thus no intra-VLAN traffic will flow between the Dell and Cisco switches. By disabling VTP and enabling GVRP on the Cisco switch, it is possible to exchange intra-VLAN data and control information in mixed Dell-Cisco environments. If you connect a 3560 or 3750 switch to a device that supports GVRP you will see unsupported messages on the switch, telling you that the device itself is not able to process the GVRP information from the hosts/neighbours and therefore it drop it. What's the hell?! CatOS is already obsolete. And IOS routers being at L3 do not even need to pass VLAN trunking information. Does it mean Cisco lock-in? Windows Preinstallation Environment (or WinPE in short) is a lightweight operating system that you can boot up to capture system images, install drivers and system troubleshooting. Think of it like the bootable MS-DOS disk in the good old days. Unlike the 16-bit MS DOS that requires separate set of drivers, WinPE leverages on Win7 drivers. Furthermore, you can make and customise it freely using Windows Automated Installation Kits (WAIK) that is also freely available from Microsoft. There are several online resources that teach you how to use WinPE. Nevertheless, here are the summary steps that I have compiled of using WAIK to capture & deploy system image. 0) Make a bootable WinPE CD, including ImageX toolkit. 2) Run sysprep, click on "generalize" and quit. 3) Boot the PC into WinPE environment. 5) Boot new PC from WinPE. 7) Map to the network folder that contains the WIM image. 8) Apply WIM image to new PC partition using ImageX /apply command. The last command returns a GUID value. Substitute with this value in the following examples. After the new node is added in part 1, all the interfaces will be listed out for you. Typically, you would pay particular attention to interfaces that are prone to congestion and link errors e.g. WAN interfaces. 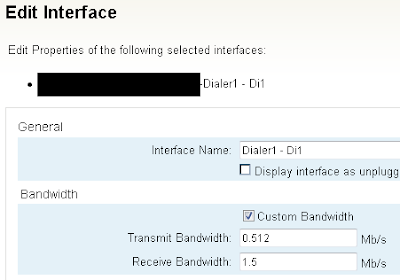 Solarwinds also automatically calculate the bandwidth utilization based on the default bandwidth of the interface. For example, Solarwinds assumes 1000Mbps bandwidth for Gigabit Ethernet (GE) interface and traffic usage of 8Mbps will constitute less than 1% utilization rate. What if that interface is connected to your service provider device that provides only 10Mbps? That would become 80% high utilization instead! To customise the actual bandwidth, click on the interface and click on "edit interface" button. Check on "Custom Bandwidth" and enter the actual transmit and recieve bandwidth.